This week's challenge from Terribleminds.com (author Chuck Wendig) was to write a horror story about a disease, just in time for Halloween. I think this one is horrible enough (no snide comments, you in the back!). It took the old first, and people accepted that they were relieved as well as saddened. Food was in short supply, with little to spare for those who were past contributing. When the disease began to move among the children, the grief was greater. Some saw it as sparing them the slow death by starvation, mental and physical, that seemed the doom of the colony. The disease itself was not so horrible, Marda thought. The old grew feverish, stopped eating, and wasted away in a few days. She didn’t say it aloud, because it sounded absurd, but she thought that they just lost the will to live. Maybe they had. It looked more sinister in the children. They, too, grew mildly feverish, but with them it was not so much that they lost the will to live, as that they lost any kind of will at all. The first a parent might notice was a child who became silently obedient. The initial response of many was to rejoice at how well-behaved their child was. Then the parent would notice the child said nothing, did nothing unless directly commanded. They showed no initiative, not even enough to eat or drink. Within two days, the fever set in, and the next the child ceased to speak or move. Death by starvation followed. If they were medically fed, they only lived long enough to lose the will to breathe. “For all that,” Marda told her partner, Erno, “death is better than life as an automaton.” She was thinking of the last stage before the fever. Marda returned to that thought in the following weeks. The disease spread among the children. It responded to no treatment, no containment strategy. If a child was dull-witted and docile, no exposure resulted in illness. And no efforts at quarantine could prevent a bright, quick and curious child from falling ill. A few recovered, after a fashion. They sat and stared together into a future that was no future. The disease had spread over the whole planet, despite the complete separation of the two populations. The planet was not large, and there were only two habitable land masses, each colonized separately. As they had quickly reached their carrying capacity, the two populations had severed all ties; it was the only way to keep their uneasy peace. Marda hoped that old enmity would have kept the other colony safe, but radio communications from the other continent crushed that hope. All their efforts to find a cure had failed as well. Efforts to cure the disease were hampered by those who saw children recover and believed the crisis had passed. Marda saw only that no one among her friends had a living child, though a few acquaintances had been left with the hollow husk of a formerly sparkling son or daughter. Some of those whose children “recovered” were unable to bear life with the shell of a person. Others rejoiced that their child was spared, and some boasted of their well-behaved offspring. Marda had to stop visiting such friends, after she had screamed at one proud mother, “Don’t you see? That’s not a child, it’s a machine! She’s not alive, she’s just breathing!” Erno had had to pull her off the weeping parent. After that, they stopped going out. Their whole group lived in the lab anyway, though with less and less hope. They were past the point where a vaccine could do any good, and they had little hope for an actual cure. Yet against all reason they held onto hope, or at least the habit of working. That lasted until the day when Tom turned from his computer to ask a question, and saw Kim sitting, staring into space with a vacant smile. “Kim! What is it? Do you have an idea?” he asked in desperate hope. She didn’t turn, or even blink, just sat. A question was not a command. The next day Kim had a fever, and her partner, Lee, sat starting blankly, moving only as told. They set him to bathing Kim’s face, resorting in their desperation to ancient ways of reducing a fever, for whatever good it would do. When Lee, too, began to run a fever and ceased moving, the remainder of their little group knew what the future held. The Disease—they had begun to think of it as the Farmer—had selected those to keep, and it was culling the others. “No.” Tom said, Erno’s echo only an instant behind. Erika said nothing, but held out her hand. On her palm lay four capsules. No one spoke as each took and swallowed the only cure they had found. They would not stay to see the end. October is getting old, and in many places fall is moving in on us. Frosty nights, rain (what's that? ), and time for hot cocoa and fires (it's been ridiculously hot here. I can only dream about fires and cocoa. More like fans and iced tea). 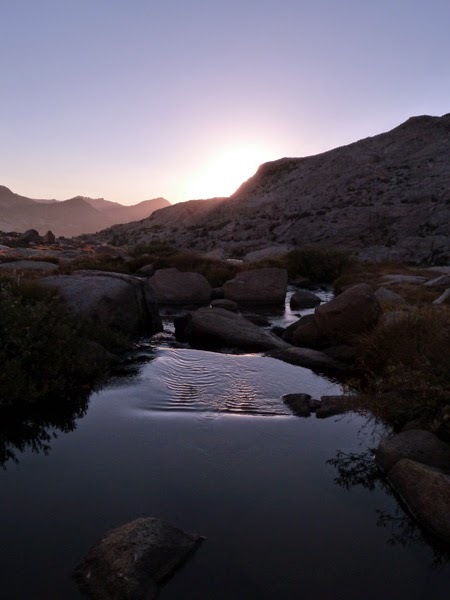 So I figured it's time for a photo essay from my trip to the Sierra Nevada back in early September. This was a novelty for me--I left my guys at home to fend for themselves and went off for a week backpacking with a couple of friends. 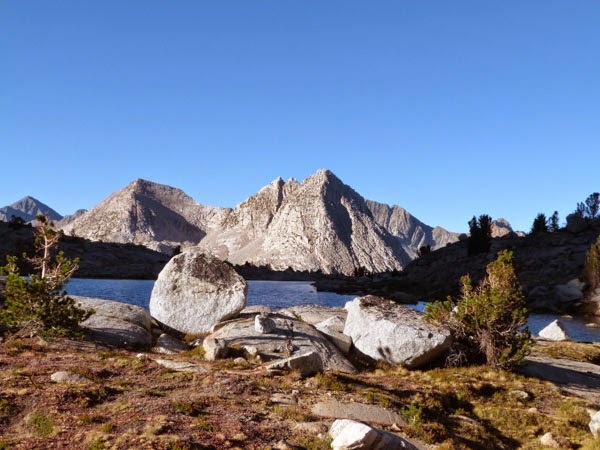 I began with the long drive to Bishop in the Owens Valley, and spent a night in the highest campground close to our meeting point. 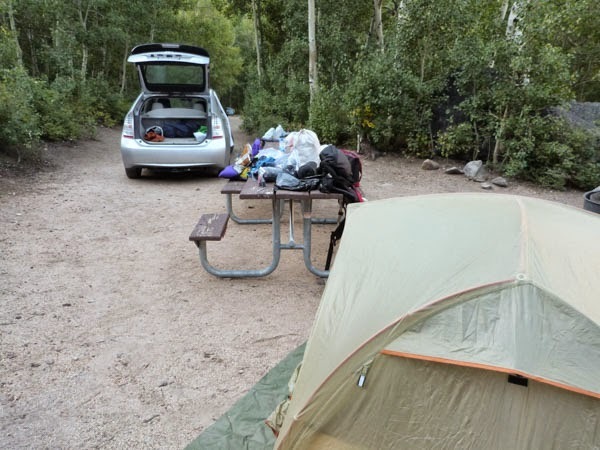 A tent, a car, and a table full of stuff to put in my pack! We started from North Lake, where the aspens were just beginning to turn color. The Sierra crest looked a long way up, so I focused on the small stuff. 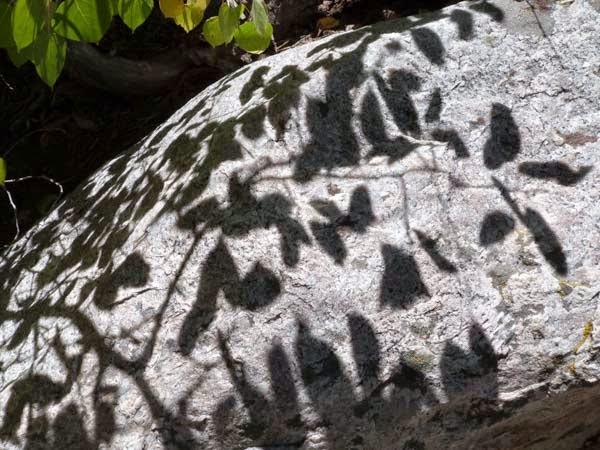 Aspen shadows on the granite. 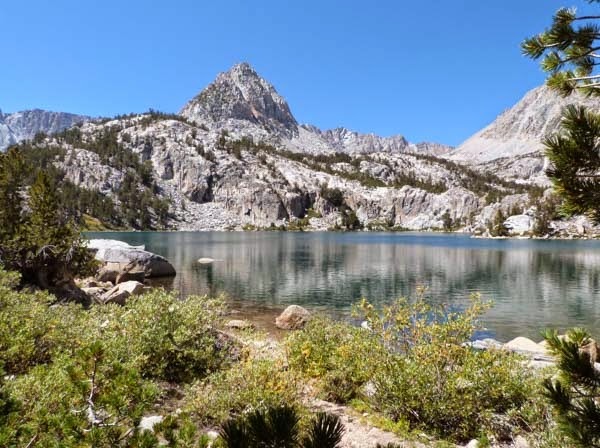 A late start and an easy hike, and we were lunching at Lower Lamarck Lake, and looking up to where we'd go the next day. 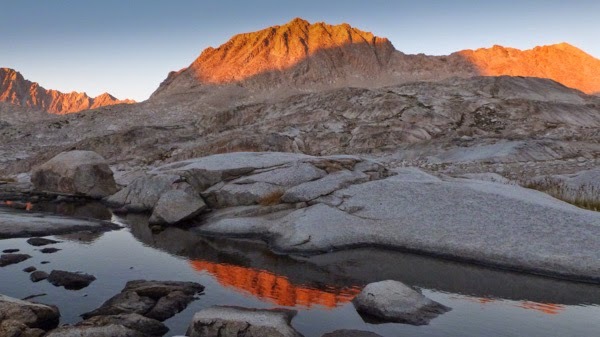 A lake, some sun, a lot of granite...another great day in the Sierra Nevada. 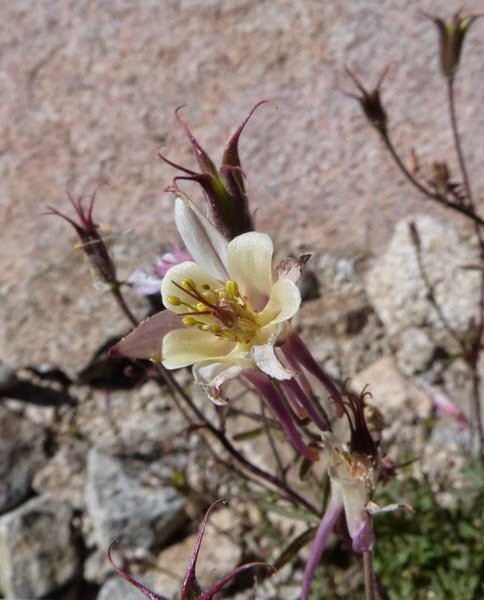 To my surprise, as we climbed toward Lamarck Col the second day, there were even a few flowers out. Most of them are done by the first week of September, but alpine plants don't waste any possible growing and spreading time. It was a long climb to the Col, with a lot of false summits and a lot of snack breaks (that's my style of hiking!). Since the Col is nearly 13,000' not much grows up there! Sacked out but not done. Felt like total triumph when we topped out not long after lunch. Despite our best efforts, we didn't lose the trail on the way up--even though I didn't think there was even supposed to be a trail. 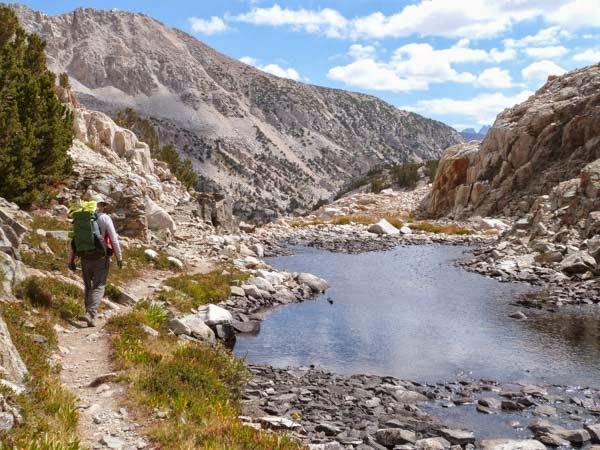 What we didn't know was how long it would take to make our way down into Darwin Canyon and along the lakes. 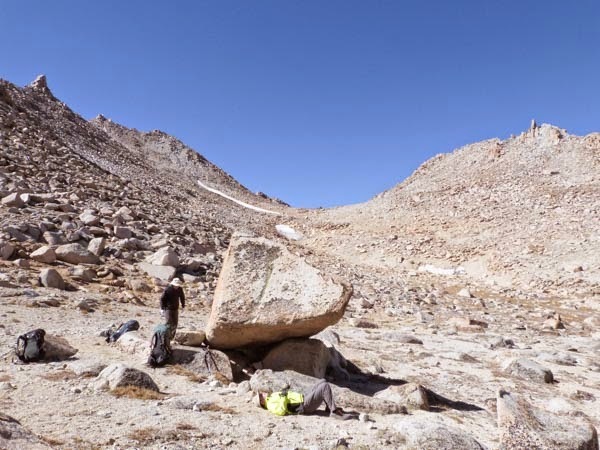 There was mostly a route down from the col (as advertised--the surprise was the constructed trial most of the way up the east side), and along the lakes trail alternated with boulder fields. 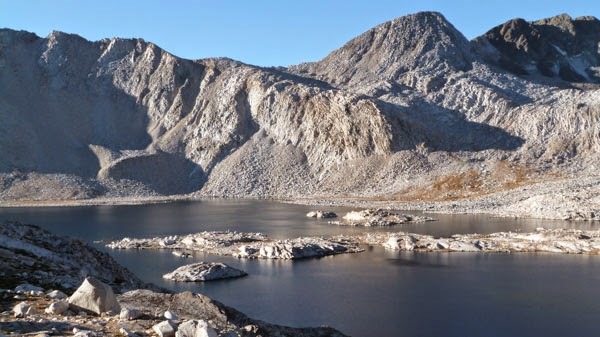 Notice how the color of the lakes darkens as you go down--the glacial silt settles out, leaving them less green and more blue. By late afternoon we were happy to find a flat spot, with water and a place for Zeke to hang his hammock. One nice thing about September, there were no bugs to prevent us enjoying the evening light. Day Three, and more sun and blue skies. 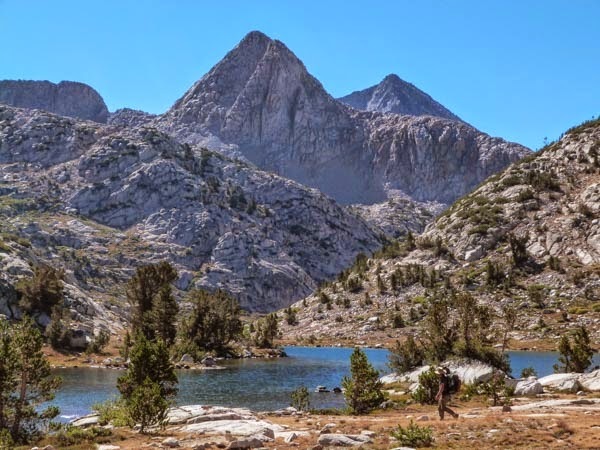 We had to find our way down off the Darwin Bench and onto the John Muir/Pacific Crest Trail, wending our way through meadows and past classic Sierra lakes before we started scrambling down dubious routes through cliffy areas. 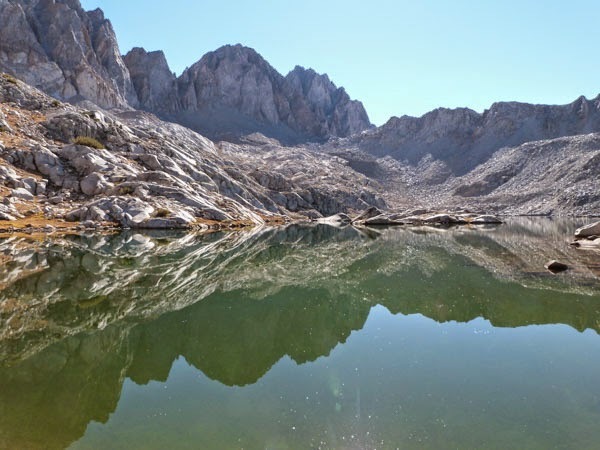 There are so many beautiful little lakes up there that they don't all even have names. 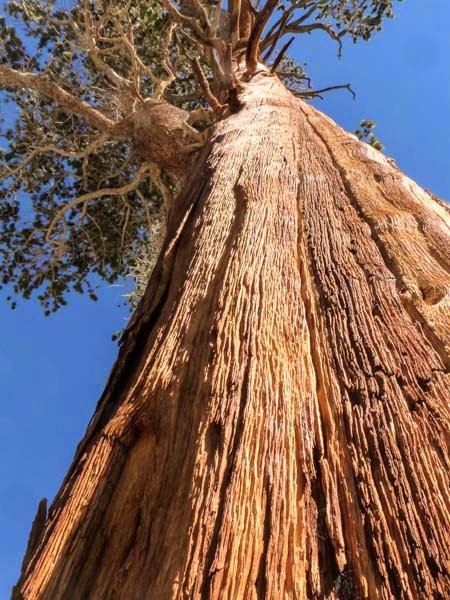 After a harrowing descent we stopped beneath an amazing white bark pine for second breakfast. Yes, I eat like a hobbit when hiking: breakfast, second breakfast, elevenses, lunch, afternoon coffee break (no coffee, but food and rest), dinner (with soup, entrée and dessert). White bark pine. Love the color of the trunk on these ancient trees. 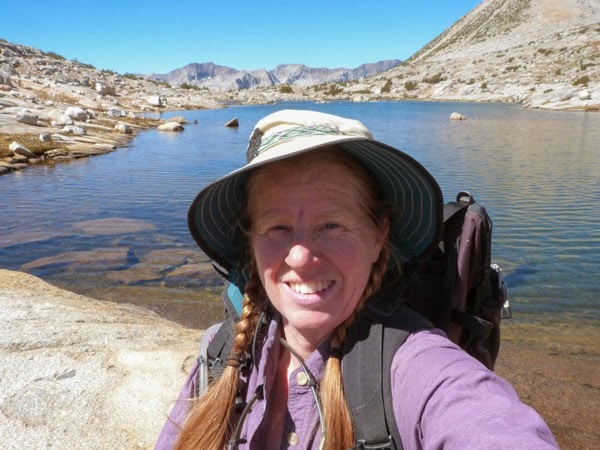 Once we hit the JMT, hiking was much faster, except for the photo stops as we made our way along Evolution Lake. That has to be one of the most beautiful lakes I've seen. The photo doesn't do it justice. Next time, I'm going to spend a night there so I can get morning and evening photos. After lunch and a nap (oh, did I forget to mention that part of Hobbit life? ), we reached our destination at Wanda Lake by mid-afternoon. This was definitely in the alpine, and there was lots of wind. It took a while to find a somewhat sheltered camp with room for 3 people to spread out. 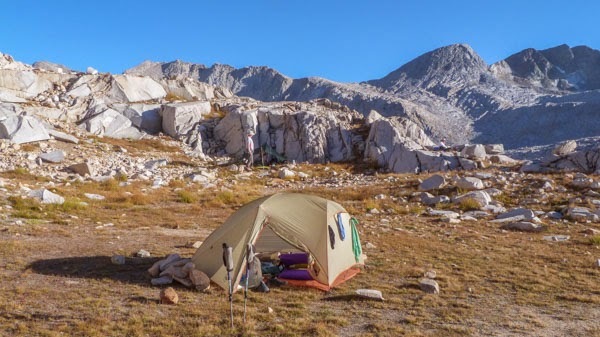 Wanda Lake camp, with my shelter in front, Zeke's back against the rocks. Zack was 'cowboy camping' up in the rocks. The wind didn't die all night, but I was able to find some protected puddles for the evening photos. 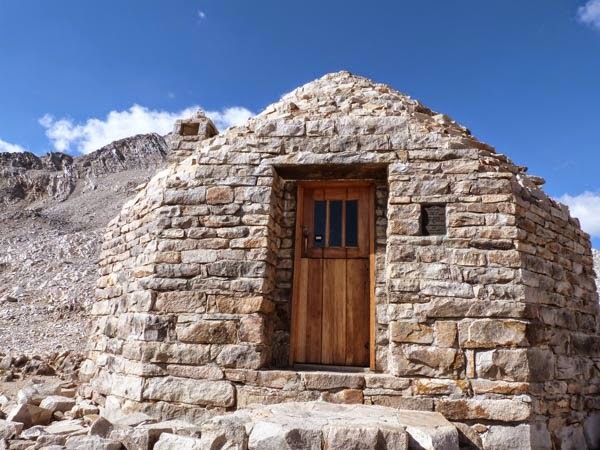 Our 4th day we left Wanda Lake and climbed just a few hundred feet to Muir Pass, where a hut, built in the 1930s, offers shelter for a summit break (and overnight shelter only for those caught in life-threatening storms). The wind seems to blow eternally through the pass, so that I suspect the men who built the hut were glad when the walls grew high enough to offer some shelter. 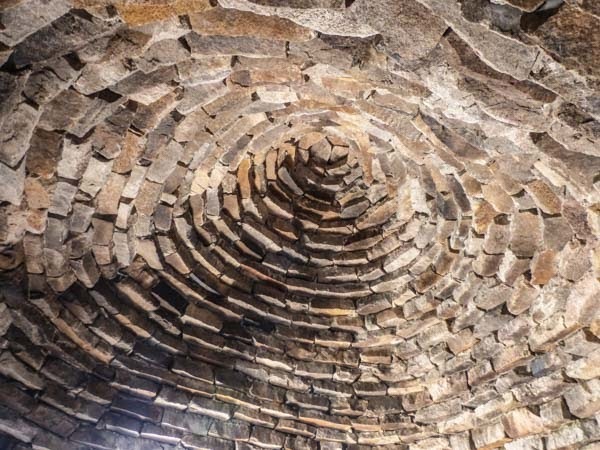 The inside of the beehive roof. The hut exterior. From only a short distance away the hut blends completely with the mountain. The day's climb was short, but it was followed by nearly 3000' of downhill, which is no joke for old knees and feet. 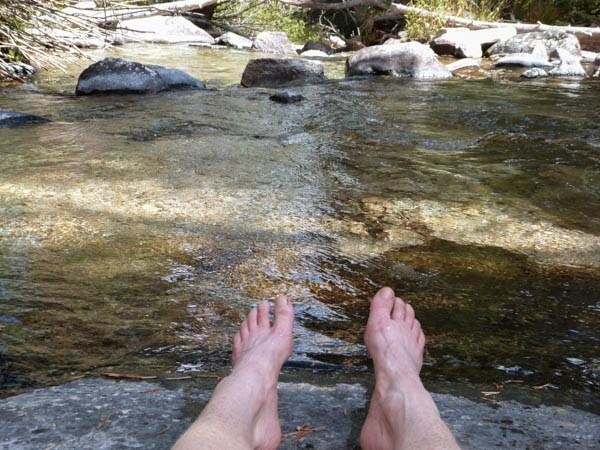 When the main descent was done, we were happy to take a break and soak the lower appendages in the icy water of the Kings River. As is the way of mountains, our trail the next day led us on to regain the elevation we lost the previous day. 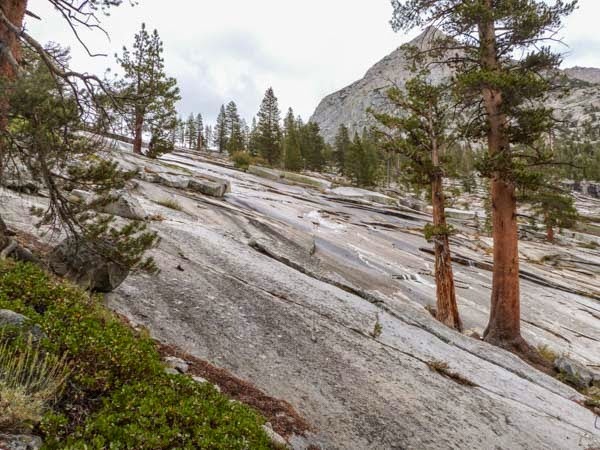 The long climb from the Kings River to Dusy Basin took all day, and took us through a range of terrain. Dusy Creek slides over the granite slab for several hundred feet, in the biggest waterslide ever, though not one I'd care to ride! 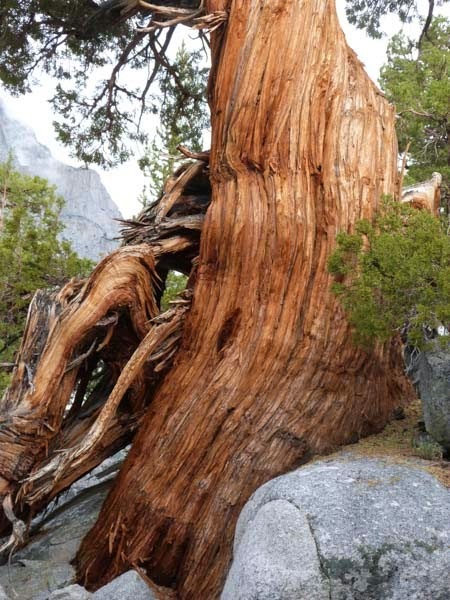 Sierra juniper, ancient trees that, like the bristlecone, live for centuries and take eons to grow in inhospitable places. 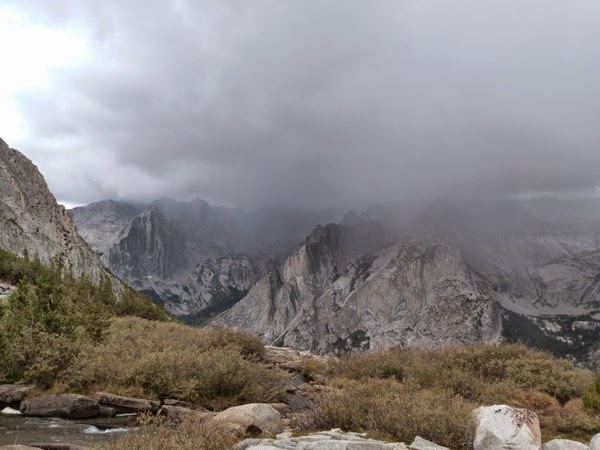 It had rained in the night, and clouds kept us cool all the way up the climb, twice moving in to shower heavily. We just deployed a tarp, hung out, and let the storms blow by while eating (of course) and telling tales of adventures past. Rain shafts moving across the canyon toward us. It took all day, and we were getting cold and tired before we found camp, and rode out one last shower before the storm blew itself off and we were left with a beautiful evening. 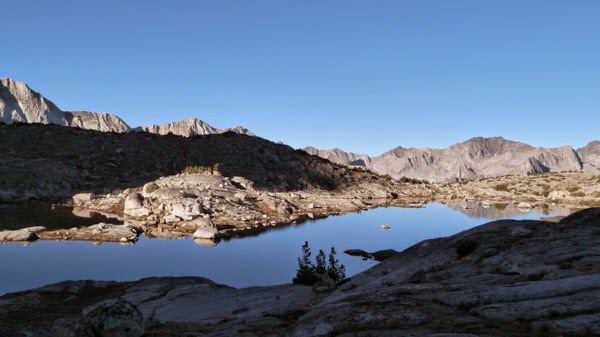 Camped by an unnamed lake in Dusy Basin. In the morning, the sky was completely clear, the air completely calm, and me near completely frozen. I got up early anyway for the photos. 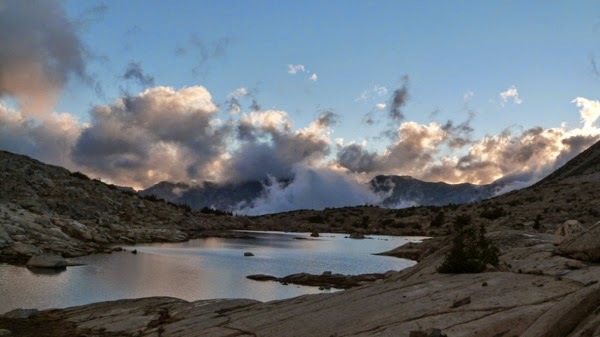 A morning spent exploring the Dusy Basin yielded many treasures, like this lake, where we had intended to camp. 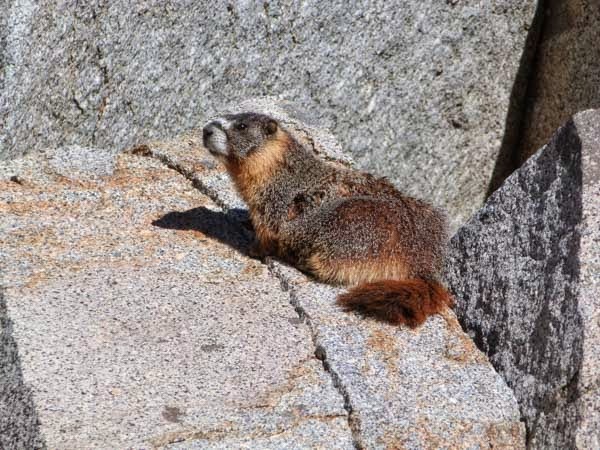 We were also greeted by a marmot, who posed for us for quite a while. Portrait of the writer in her favored habitat. 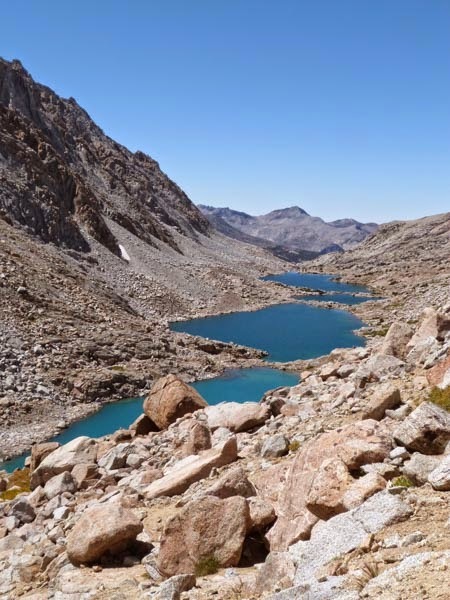 After lunch, we packed up camp and headed on over Bishop Pass, a few miles closer to the cars. 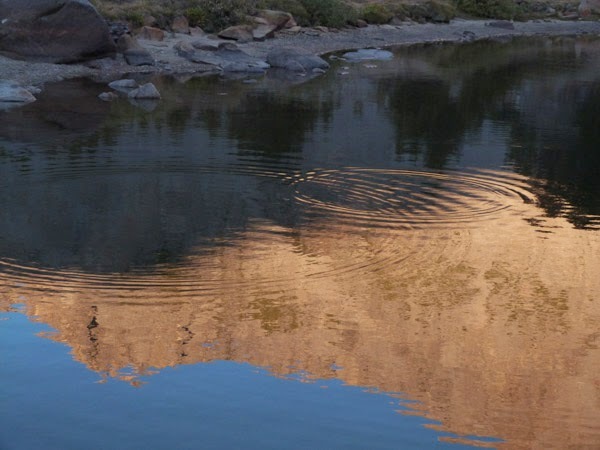 I had a meeting to be at the next day, so I enjoyed the evening light, and was up at dawn to hike out. I always am happy to see the car at the end of a trip--nice to see it's still there, and in one piece! In this case, since I had started early and hiked fast, arriving at 8:45 a.m., the car was also covered with frost I had to scrape off before I could drive! A shower at the nearby pack station, a cup of good coffee from a cafe in Bishop, and I was ready to drive back home. The last of my summer adventures, and a mountain fix to last me until spring! Yeah, I know. "Flash Fiction Thursday" doesn't alliterate like it does on Friday. But I do like to post to Chuck Wendig's challenges on Thursday, before everyone has lost interest. This week's challenge was to write a bit of horror framed as a spam email. I didn't go very horrific, of course. In fact, at first I thought I couldn't do this at all. But while I was out biking on Sunday it occurred to me that one kind of scam/spam was perfectly suited to a Halloween theme, if not real horror: the grandchild in need. Chuck suggested limiting this one to under 500 words; mine is only 367 including the title. I regret that I cannot reproduce the machine-translated English of most spam (well, no, I don't regret it at all. But you know. I had to say it). I am in such trouble and I need your help. I was on our school trip to Romania and we were staying in this really cool castle in Transylvania. So I totally fell in love with our host, this guy Vladimir who lives in the castle. He is sooooo cute! And he says he loves me too, but he’s pretty desperate so I don’t know. See, now he’s saying that he wants to keep me forever, and that I need to give him money. I mean, I know that castles like his cost a lot to run, and that’s why he rents it out to tourists and sleeps in the basement. Well, in the crypt, really, but it’s totally nice and dry and all, and he says he doesn’t mind a few dead ancestors. Real aristocrats are so much more matter-of-fact about that stuff, aren’t they? But if I don’t come up with the money, he says—well, I never noticed his teeth, because you know, guys with those smoky sultry good looks don't grin or anything. He’s making me kind of nervous, I mean this is Transylvania after all. And I don’t think I want to be his bride, even if he is a Count, and for sure I don’t want to let him bite me on the neck. But that’s the thing: he says if you don’t send money, I can either join him in his crypt or he’ll give me to his friend Wolfgang. The one Vlad calls “Vulfie” with a raised eyebrow, just to make sure I know what sort he is. I’m afraid I kind of boasted about how rich we are, when I was first getting to know Vlad. I mean, he’s a Count, you know? I didn’t want him to think I’m from some ordinary family. So he wants like, a million dollars? Please, scrape up whatever you can and wire it to me at 1600 Transylvania Avenue, Transylvania, Romania, unless you want your favorite granddaughter turned into a vampire. Or eaten by a werewolf. P.S. Hope your arthritis is better! This book started with a little advantage, being set on Chincoteague Island, a place well known to and beloved by all fans of Marguerite Henry and Misty of Chincoteague. All resemblance to that childhood classic ends at the causeway to the mainland, however. 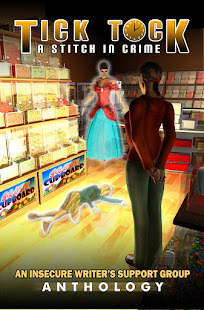 Murder, mayhem and a dash of romance kept me fully occupied with never a pony in sight. Because this is Book 3 in the Patience Price series, there were things that confused me, and a lot of references to the chaos that had gripped the Island since Patience's arrival that made me want to go read the other books. I had a little trouble keeping track of all the characters, probably partly because of that history I didn't know. The mystery is fairly well put together, though I was a bit put off by the ending. I will also say that Ms. Price pushed some buttons with her interference in police business, and still more with her foolhardy behavior on more than one occasion. Those factors did detract from an engaging story that picked up speed as it went along until flying on to the end. Pacing was excellent; behavior of characters was at times inconsistent or unconvincing. Despite that, I found myself rooting for Patience and her friends, and needing to know how the story came out. 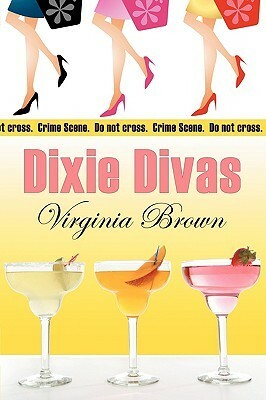 This is a cozy mystery that leans on the romance side, with as much of the story about relationships as about crime. I recommend it for those who like books and series where you get deeply involved in the characters' lives, however disfunctional they may at times be. In any case, Patience and her friends do put the "fun" in disfunction, so they are worth the time for a quick romp. 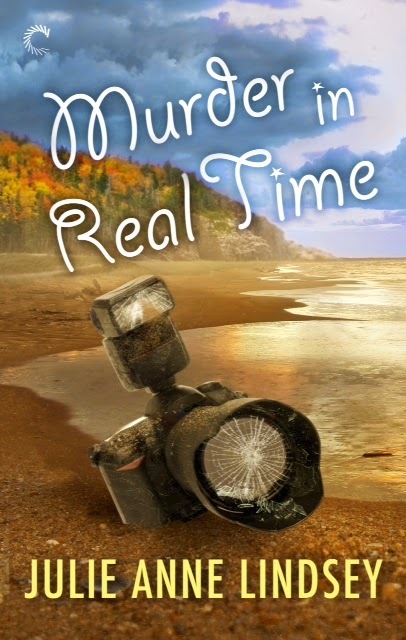 Full Disclosure: I was given an electronic review copy of Murder in Real Time in exchange for my honest review, not for a positive review. The opinions expressed are my own and those of no one else. I am disclosing this in accordance with the Federal Trade Commission's 16 CFR, Part 255: "Guides Concerning the Use of Endorsements and Testimonials in Advertising." First, and most important: Jemima Pett has unraveled all the dastardly deeds in our serial mystery, "Half a Clue." If you haven't been following along, the rest of the story is collected here. Now, for my story. This week's Chuck Wendig Terribleminds.com challenge was pretty simple. We were supposed to pick three names of types of apples from a list, and use them in some way in our story, as apples or just as weird word combos. Naturally, I read it in a tearing hurry and didn't get it right. Instead, I selected just one and used it as the title of my story. Close enough, since no one is grading us. Are they? Hope I'm not going to get sent to the principal's office again! Claire sat under a tree in the middle of the orchard, throwing hard, tiny apples at the tree trunks. The apples were the extras, the ones the trees shed because they couldn’t grow so many on one branch. The small missiles thwapped against the tree-trunks like little bullets. Claire could throw, as she could do so many things, because of her brother Jim. Jim had mostly taught her to throw by mocking her attempts until she mastered the art. It had taken a lot of watching him play baseball to figure out what she was doing wrong, and still longer to learn to do it the right way, but she’d done it so she could finally hear Jim say, “Good pitch, Sis. You’ve sure gotten over throwing like a girl.” Claire refused to say she was learning to throw “like a boy.” Throwing with power and accuracy was just throwing well, not like a boy. Ping! She nailed another tree. Splat! That one had been half rotten, and spattered satisfyingly when it hit the gnarled trunk. Claire didn’t feel satisfied. Claire was sitting in the orchard because Jim was gone. For all her 12 years, he had been there, teasing her, fighting with her, and teaching her how to live. Now he had gone off to fight in the War, and everyone said what a wonderful thing that was. Everyone but Claire. Well, everyone but Claire and her Dad. He had refused to say a word against Jim’s going, but she knew when he was unhappy by the tight look on his face. That look had come onto his face when Jim announced he was enlisting, and it never left anymore. To make matters worse, Claire and her father were both realizing that it had been Jim who had raised her, in his own boyish way. Their mother had died of the ’flu when Claire was a baby, but thanks to her brother she’d never missed having a mother. Until now. Now she not only had no one to teach her to be a girl, at an age when she was beginning to realize it might be a good thing to learn, but she had no one to teach her to be a tomboy, either. No one to admire her for hitting every tree she aimed at, and no one to scold her for getting grass stains on her Sunday dress from climbing trees after church. Dad never noticed. Claire heard her father call from the house, and climbed to her feet. She took her time brushing the dirt and grass from the overalls she wore everywhere but school and church, knowing that the dinner he called her to would be poor, their time together strained. Without Jim, neither of them new how to talk about missing Jim. She paused beneath the tallest tree in the orchard—the only one that wasn’t an apple tree—and peered up through the branches. Father had never been willing to cut down the huge old pine, and at the very top there was always a crow’s nest. Every year Claire vowed she would climb up and look into it, as Jim had done. She never had done it. Not yet. When the telegram arrived, only weeks after Jim had gone into the trenches, Claire knew the world had ended. Everyone knew what it meant when you got a telegram, if you had a boy at the Front. She didn’t even stay to see Dad open it, and she didn’t stop to hear the delivery boy’s sympathy. He’d known Jim at school, so he meant it. But he’d said the same words to so many families. Claire fled to the orchard, to the trees. She stopped beneath the old pine, and began to climb. Claire didn’t stop until she reached the top, and could see into the crow’s nest. The bird was away, stealing apples or eating worms. She looked at the nest, a mix of old weaving and new, and far larger than seemed necessary for the single egg that lay there. The egg was smaller than she’d expected, to hold all that potential life. Life like the one Jim wouldn’t get to have now. Suddenly she hated the crow, hated the egg, hated those lives that went on while Jim’s—and hers—ended. She reached out with one hand, clinging to her perch with the other, and snatched up the egg. It was warm, and smooth, and harder than she’d expected to crush. She shifted her fingers and squeezed again, and felt the sharp shards of shell cut her hand, the warm liquid pour through her grip. She dropped it, and saw the tiny, unformed crow she had killed, and began to cry, even as she heard her father’s voice calling her name. Uncomprehending, she stared at the bird she had killed, at the agitated crow now circling her head. “I’m sorry,” she whispered to both, and began the long climb down. Never say never. I say that I never review picture books, but this one was so funny I just had to. I was working the desk at the library while the Storytime Lady was reading it, and thought I was going to die. Moo. That's the whole story. Well, of course, not really, because though the only word in the book is "moo," the story is told in pictures. To put it flatly, a cow decides to take a car for a little drive, and hilarity ensues. You would never believe how much you can say with a single word. The story is funny, with a cow that reminds me of Minnie and Moo (Denys Cazet). Cow (Moo?) gets very excited at the idea of a car, and the expressions on her face as she drives off are priceless. But the absolutely best moment is the long paragraph of moos in which she explains it all to the police officer. Anyone who can get through it without giggling is inhuman, or possibly superhuman. This is definitely a read-aloud book, as much of the story comes in the expression you put into the various moos. If you are a person who reads in an monotone--maybe not the book for you. 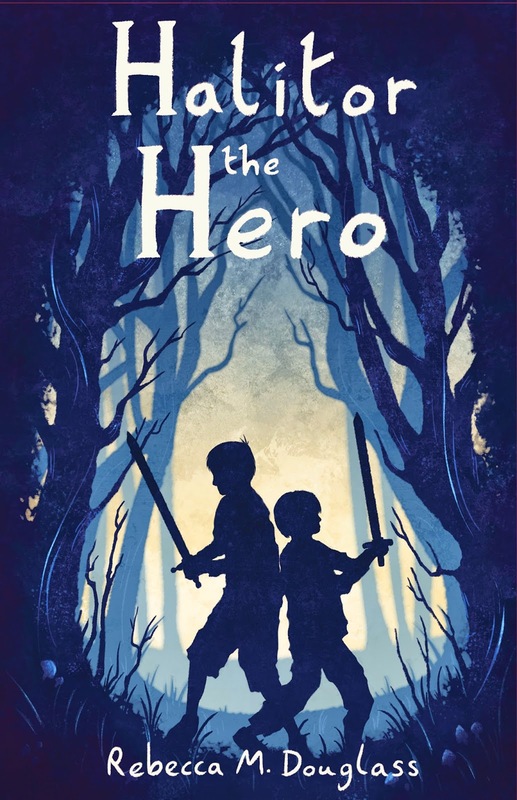 But if you like to throw yourself into a bit of dramatic silliness, read it to your kid! If your kid is too old, or you don't have one. . . beg, buy, borrow, bum or steal one so you can read this book! Full Disclosure: I checked Moo! out of my library, and received nothing from the writer or publisher in exchange for my honest review. The opinions expressed are my own and those of no one else. I am disclosing this in accordance with the Federal Trade Commission's 16 CFR, Part 255: "Guides Concerning the Use of Endorsements and Testimonials in Advertising." Now go hop around to the other participants in the KLBH--just click on the badge at the top of the page! When Melbourne's #1 flapper detective Phryne Fisher decides to take the train to Ballarat, she lands herself in the middle of her next case. She awakens in the night to find that the First Class carriage has been poisoned with chloroform, and one passenger is missing. Searching for the murderer leads Phryne to a lost girl, a white slavery ring, a (another) beautiful lover, and a spot of danger before she sorts everything out, sees the killer hauled away, and everyone can relax with a cup of tea. While Kerry Greenwood's Phryne Fisher mysteries tend to be short, they are jam-packed with action of all sorts. Murder on the Ballarat Train is no exception. We are whisked from hairs-breadth escapes to luscious seductions to shopping expeditions and excursions into the seamier side of Melbourne, and Greenwood never puts a foot wrong. The killer was fairly easy to guess, but it took Phryne a bit of work to line up the proof and confirm my guess. And during the whole case she never loses sight of the importance of protecting the pair of abused girls who show up on her doorstep (nor of the pleasures of seductions). Searching out the truth of their lives involves two of Greenwood's more delightful creations, Bert and Cec, always a crowd-pleaser. As is frequent in Greenwood's books, there are two equally important plots apparently running parallel throughout the book. In some books, they remain parallel to the end; in this case they are brought just close enough together to satisfy, while remaining realistically individual. This is a very sound mystery for any lover of mysteries, but will especially appeal to those who like period pieces (1920s), and those who are not troubled by a freely sexual female lead. Full Disclosure: I checked Murder on the Ballarat Train out of my library, and received nothing from the writer or publisher in exchange for my honest review. The opinions expressed are my own and those of no one else. I am disclosing this in accordance with the Federal Trade Commission's 16 CFR, Part 255: "Guides Concerning the Use of Endorsements and Testimonials in Advertising." Yup, just in time for Christmas! But if you are a blogger and you just can't wait, I have electronic ARC's available. Drop me an email and let me know if you would be interested in getting a review out there in advance of the release date. I'm a bit late this morning--so sue me :) It took me a little extra time to figure out where to go next. I'm sure hoping Jemima Pett will be up for the next section! For those who haven't been following the story, the first four parts are here. First, I have deleted the last paragraph of my previous segment, as it contradicted something that had come before. At his side table in the lounge, Harris turned a page of his paper and glanced over it at Miss Black and Private Peacock. Their heads were tight together as though sharing secrets, but they didn’t seem to be in agreement. He watched the girl’s startled reaction when Professor Plum crossed briskly from the doorway and touched her on the shoulder. “No, no,” the girl said quickly, with another look at Russell Peacock. She rose, pale but composed, and walked quickly to the door. Behind her Peacock made as though to get up, checked himself, and sat looking confused and helpless. Scarlett pushed open the door of the study in time to see the Inspector put something into his lap. Her frown came and went almost too quickly to see. “I’ve come to make a statement,” she announced. “Yes?” said the Inspector, seeing she meant something more than that she had come to answer his questions. He waited in the quiet, attentive manner that often brought people to speak more freely than they had intended. “Yes?” he repeated, hiding his shock at her calm declaration. “He attempted to force his way into my room late last night,” she said. “I beat him off with the hearth-broom, but he threatened to come back with the means to force me to, to see him,” she faltered, unable to say more. “So I took up the poker and followed him, and”—her confession was cut off as the door slammed open. “And how do you know that?” Clueso considered the young pair, each pale and desperate, and wondered for a moment if they had worked together to rid the neighborhood of an annoyance. That got Clueso’s full attention, but didn’t leave matters any clearer. “So you returned to the house and strangled the Colonel?” Clueso asked, watching closely for reactions. Miss Black drew in a breath sharply, but Peacock had already answered before she could speak. “Why?” The Inspector silenced the girl with a look, though she now seemed to relax, as though reassured. He remembered that she had found the body, and may well know how he died. Apparently she hadn’t thought to tell her young man. “He—I—” The young man floundered for a telling moment, and Clueso held up a hand. “Never mind, Private. You make a poor liar.” He turned to Miss Black again. “And you? How did you kill the man? Though at least you appear to know why,” he added dryly. “I did not kill him,” she answered promptly. Her confidence in Peacock restored, Clueso could see she no longer felt the need to confess. He opened his mouth to press her further, when the door flew open once again. Available now for pre-order from Amazon Kindle! Time for a Classic Mystery! 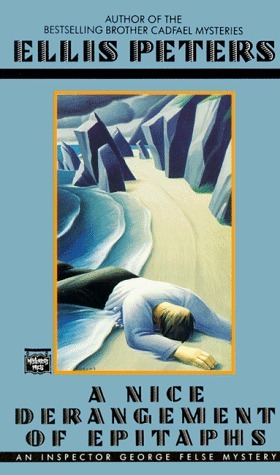 Publisher: My edition: Warner Books, 1992, 196 pages. Originally published 1965 by Collins. Source: Been on my bookshelf for ages; yes, I've read it before. This is the 4th book about Detective Inspector George Felse. He and his family (wife Bunty and 18-year-old son Dominic) are vacationing in Cornwall and get caught up in the local excitement--the opening of the grave of 18th-Century local squire and poet (and smuggler, if not pirate) in search of his lost poetry. What they find--and don't find--in the grave sets off a series of events that draw in not only George, but also Dominic. I'm very fond of Peters' writing. Many people know about her 12th-Century monk, Brother Cadfael. Fewer know the Felse family, but they are well worth investigating if you can get your hands on the books (I think they've all gone out of print). Bunty tends to get short shrift (in apology, Peters wrote The Grass-Widow's Tale, which is Bunty's own adventure and mystery to solve on her own), but Dom is usually in it up to his neck, and this book is no exception; the book is as much his story as anyone's. Peters knows how to put a story together, with the right mix of the unexpected and solid police work, mystery and human nature. Her tone in these books, however, I suspect is not for everyone. There is a certain quality (which I am having trouble defining or describing. Wonder, maybe) which give the books an almost mystical air, even when firmly anchored in the real world. Or maybe the coast of Cornwall is a bit removed from the real world in any case. I think that Peters' biggest weakness is the tenderness with which she treats lovers and the young. 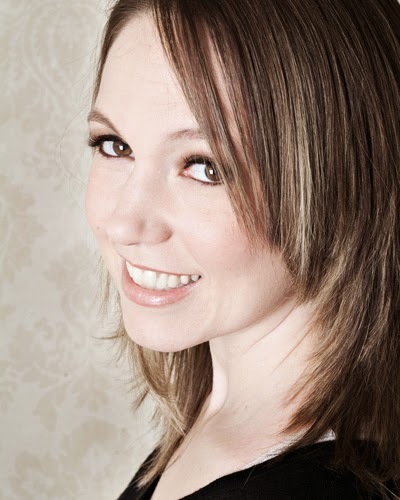 I have the feeling she never had children, because the children she writes are just a little too amazing, and can always be trusted to be on the side of the angels, even if full of mischief. Maybe she was just writing in a more innocent time. For all that, I love both the characters and the writer. For fans of classic British whodunnits and the precursors of the cozy genre. It doesn't hurt if you like a bit of word play, as the title suggests. 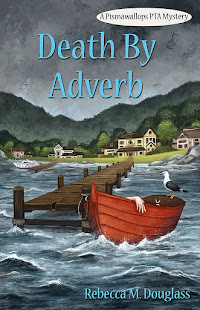 Full Disclosure: I checked A Nice Derangement of Epitaphs out of my library, and received nothing from the writer or publisher in exchange for my honest review. The opinions expressed are my own and those of no one else. I am disclosing this in accordance with the Federal Trade Commission's 16 CFR, Part 255: "Guides Concerning the Use of Endorsements and Testimonials in Advertising." Three weeks ago, Jemima Pett started a story for a challenge from Terribleminds.com. Two weeks ago I wrote the second part. And we were having a lot of fun with our story based on the game "Clue" (that's Cluedo to the Brits). We decided to keep passing it back and forth until a solution and a conclusion appear. Jemima posted Part 3 yesterday. Today I'm posting Part 4. I can't promise we'll both make progress each week, but there should be something each time. For convenience, I'm making a page just for the accumulated story, so you can go here to read everything to date. The Professor’s quick, darting glances about the room appeared more inquisitive or habitual than nervous. He was a man used to assessing strange situations. “No!” He answered with curious emphasis. “I consider this my home,” he added. Professor Plum’s eyes darted for a moment to an odd stone god on the desk, as though seeking oracular guidance. “They are, for the most part, known to me,” he acknowledged. Plum went out, leaving Clueso to wonder what Miss Scarlett might be telling the soldier. He took another look at the evidence bag in his lap. The small, ornamental stone knife might be Egyptian, he supposed. Certainly it was not part of a soldier’s kit. But most probably it belonged to the house, whoever had used it. A dark stain outlined the carvings, highlighting the leering animal god on the hilt. Across the room, Harris folded the paper and took up a book instead. He settled back and more or less vanished into the upholstery as the door opened. In addition to the title and subtitle (annoyingly all in lower case, which I find very weird for a book about getting everything right when writing), this book has the statement on the cover, "A friendly, practical guide for writers, students, business executives, Web developers--and anyone else who wants to write well." That is a decent summary of the book, which offers an extremely brief and easy-to-read summary of some key issues that will make your writing stronger. 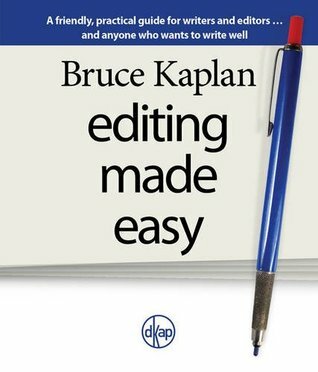 Editing Made Easy has a noticeable bias to journalistic writing, and scarcely acknowledges that matters can be different for fiction. I found that bias annoying, especially as there were some examples (particularly in the section on pronouns) that came out clunky. I get the need to make pronouns actually align with the right subject, but repeating names too often is inelegant. Find a better way. And an insistence on shorter and simpler sentences is not all bad, but a writer of fiction needs to remember that there are times to take a different approach. I'm more of the "mix it up" school of writing that believes flow is optimized by using both long and short sentences and paragraphs. Again, I think this reflects the journalistic bias of the book. Overall, however, the book offers a quick and simple reference for areas in which many writers go wrong: commonly misused or confused words (I LOVE lists that I can go to in a hurry to find out if I mean stationary or stationery, since I can't remember from one time to the next! ), basics of punctuation, avoiding the passive voice, and some commonly overused words. I added a couple to my standard late-stage-editing searches: "of the" and "that" in particular, though again, not every instance of "of the" needs to be replaced with a possessive. The book is very short and easy to read, so my time commitment was small (and I read it during a shift when I had to be sitting around in the library looking sort of official, so it worked well). I probably wouldn't recommend this for accomplished writers, but anyone who feels a bit insecure about some of the rules and regs could find it helpful to have around as a reference. Mr. Kaplan really ought to find a better designer, though. Printing all the titles (of chapters as well as on the cover) in lower case is just wrong on a book of this sort. For those who want a quick reference for tricky spellings and usages, or a fast review of things like active and passive voice. Full Disclosure: I checked Editing Made Easy out of my local library, and received nothing from the writer or publisher in exchange for my honest review. The opinions expressed are my own and those of no one else. I am disclosing this in accordance with the Federal Trade Commission's 16 CFR, Part 255: "Guides Concerning the Use of Endorsements and Testimonials in Advertising."